How to Take Care Of your Mesh Screen To Increase Productivity. Just learn how you can take care of mesh screen here. For screen printing shop, one of the major expense is the screens. You need to know how to clean, care and store your screens properly. This will maximize the lifespan of the screen and you will get the most out of your screens. This eventually leads to efficient cost-cutting for your business. Getting the most out of your screens starts with having high-quality screens in your print shop. For most printing businesses, it is tempting to purchase budget-friendly screens in the view to keep operation cost low. However, it proves expensive in the long run. In reality, you should be purchasing the best screens with sturdy frames and highly durable mesh. It’s true that you can use a screen thousands of time, but for that, you need to know how to properly care your screens. You have to properly clean and reclaim them. On one hand, you have to keep in mind not to be rough with your screens, which can lower its lifespan, on the other hand, not cleaning them thoroughly will result in poor emulsion adhesion and blurred prints. To address these issues, you need to clean a screen as soon as possible after printing. If you let the ink sit for long, it will be difficult for you to clean it later. And then later you have to be more abrasive than necessary. When you are cleaning your screen, you have to let the chemical do the job for you. First, let the emulsion remover soften that stencil and then force it out with a pressure washer. To avoid warping of the screens, you need to keep pressure washer on the lowest setting possible. You must also avoid scrubbing, because it may fray the mesh screen. For any stains on the screen, you could use a haze remover. The stains on the screen can restrict the mesh openings and interfere with printing. If you use retensionable screens, you need to know how to adjust the tension of the screen the right way. Printers should adjust it slowly in phases so that the screen holds itself without shocking or tearing. You should increase the tension of the screen in thirds or fourths of the total tension, at the same time waiting for at least half an hour before increasing the tension. Also, you have the know the tension parameters for the screens and also have a measuring tool to keep track of the screen tension. Keep your staff well-informed about how to properly handle screens. In many print shops, a majority of screen damages happen because of accidents that are avoidable. You must also take care of properly storing screens in your print shops. Find a clean and dry spot to store your screens. If you are using wooden screens, you need to store them in an airtight container to keep out moisture which could warp the wooden frame. Even a tightly tied large garbage bag would do the job. Your staff should also know when to replace screens which have got damaged to the point where it can longer be used in printing as it could interfere with the print quality. Screens could be used to the point when it will no longer hold tension, or when it is frayed and obstructs inks passage through the screen openings. Damaged screens will give a grey hue which cannot be cleaned and will have a saggy mesh which can’t be tightened. Some may include bowed frames. Screens are one of the major parts of the print shop budget. 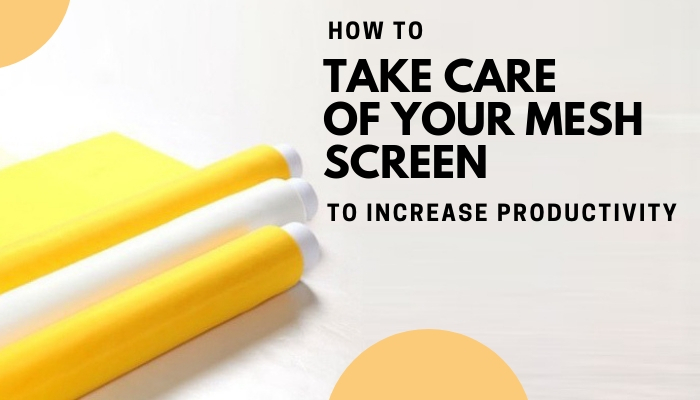 Taking care of the screen would lead to lower expenditure in the long run as you can get the maximum amount of prints out of each screen you purchase.